I am so excited to share this project I did for Jo-Ann Fabrics and Craft Stores ! Jo-­Ann Makes spring crafting easy during National Craft Month with a $5.00 off $25.00 purchase coupon , and a spring crafting inspiration website !! Florals are a big trend this spring , and I hope you like my version of the floral trend ! 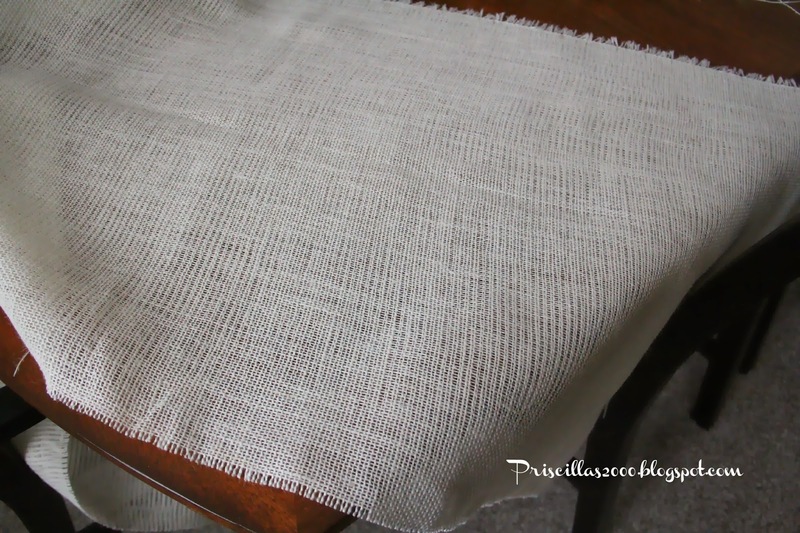 2 yards white burlap, 2 yards fusible stabilizer, one side is fusible , one side non fusible. 3 different sizes of black and white check ribbon, 2 rolls of each.. 2 packages of covered buttons. 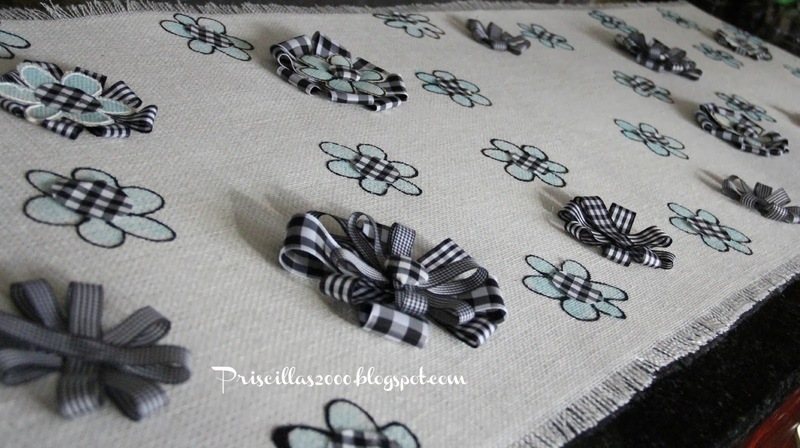 black and white check fabric( how much you need will depend on the size you want your ruffles. 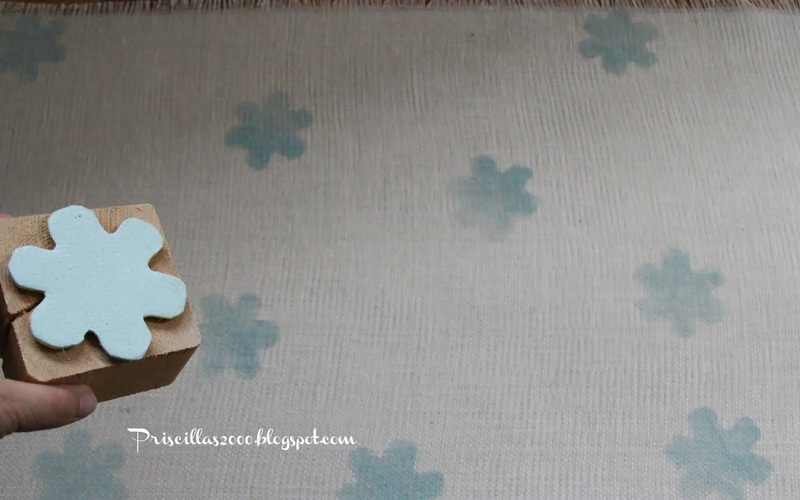 A stamp for the flowers , or a foam piece and a scrap of wood to make your own. 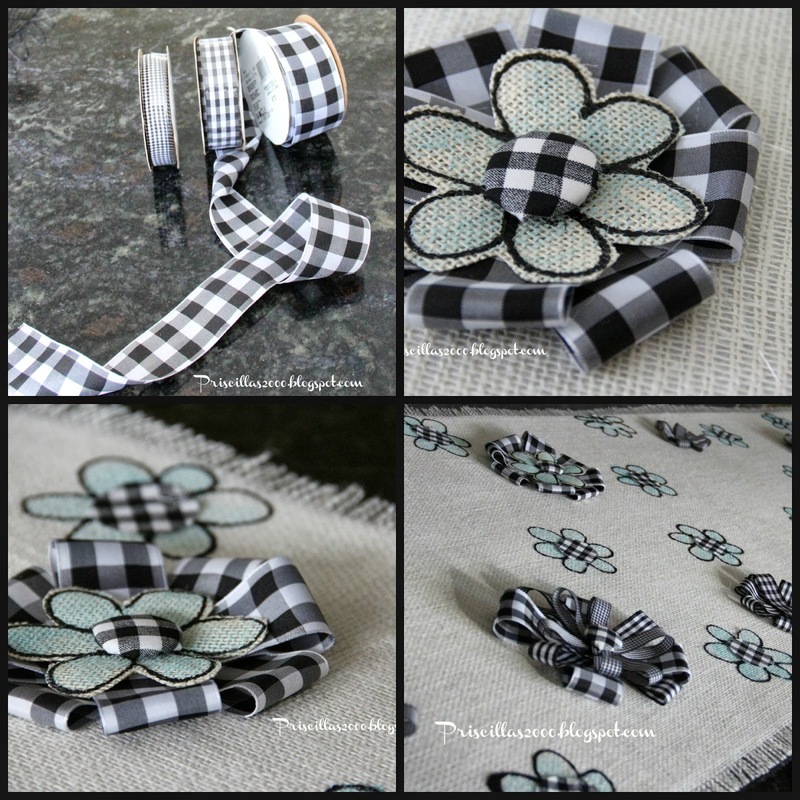 Craft paint in aqua, and fabric paint in black and white. All the supplies are available at Jo-Ann Fabrics ! The edges of the burlap are frayed , so I decided to go with that . I cut the burlap in half down the fold , so I have 2 - 2 yard pieces. So you could actually make another runner for a different season. I followed the instructions on the iron on stabilizer. It made the runner pretty stiff.. Great stuff ! Then I frayed the other side , I had to cut a little off .. The stabilizer holds the frayed edge so it won't fray anymore. When you iron it , line the stabilizer up so its not over the top of the frayed edge. 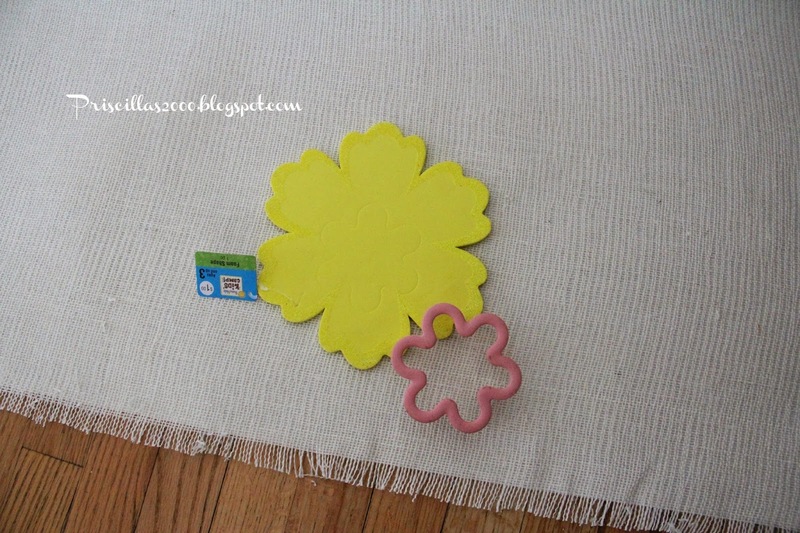 I couldn't find a big enough flower stamp so I bought this foam flower shape in those dollar bins at Jo-Ann. I used a cookie cutter and pushed it into the foam to make a pattern . Cut it out and hot glued it to the wood block. I randomly stamped the flowers onto the burlap. I left pretty big spaces since I wanted to add the ribbon flowers. I used fabric puffy paint in black to outline all the flowers. These are the three sizes of ribbon I used , I cut the ribbon into 4 and 6 inch lengths. folded in half and glued, then stacked 6-8 of them to make flowers .They were all hot glued on. 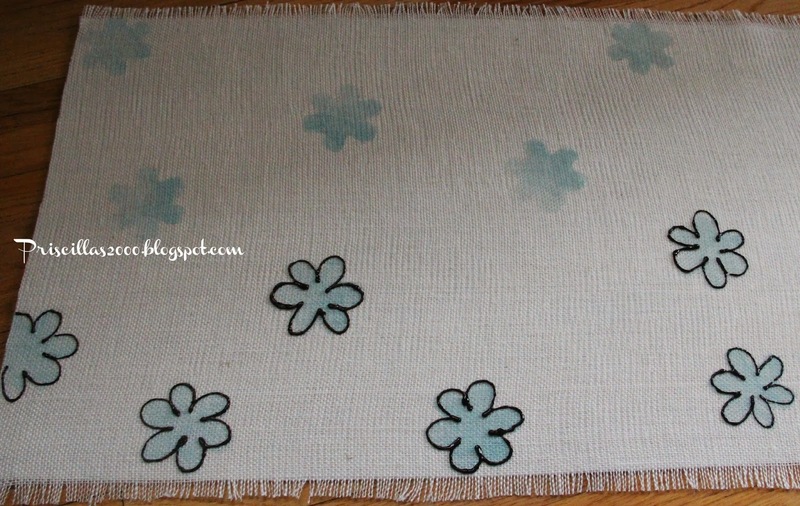 I also stamped some more flowers on the extra burlap cut around them and used them for the center. Covered buttons were also added to the centers of some of them . 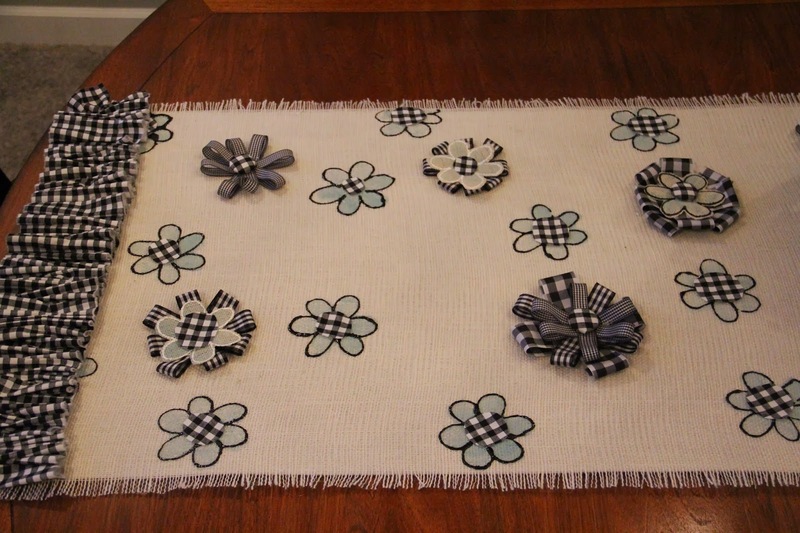 For all the stamped flowers I cut circles from the black and white check fabric and glued them down. For the ruffle I tore 4 pieces 5 inches each by the width of the fabric. I used heavy thread and gathered 2 pieces for each ruffle, by hand. you could also use a sewing machine, I was trying for the whole no sew approach ! I hot glued the ruffle onto the ends of the runner. 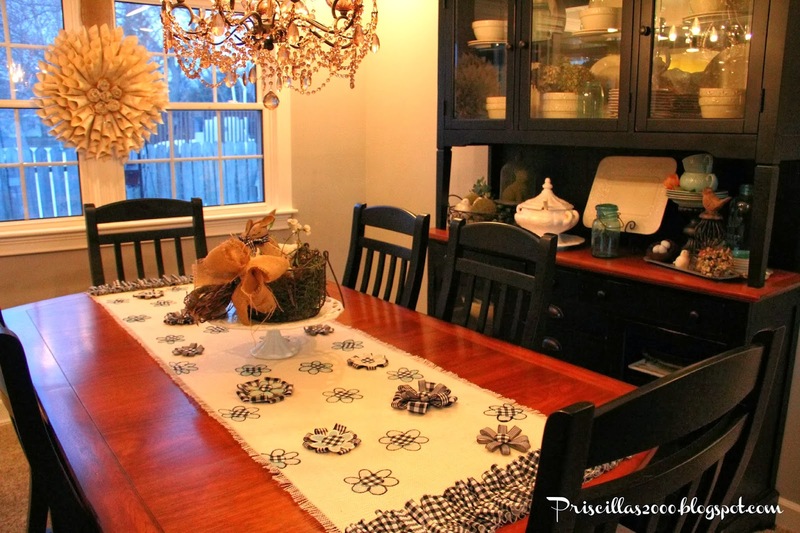 Since our dining room furniture is black , I love the black and white check with that fabulous white burlap ! 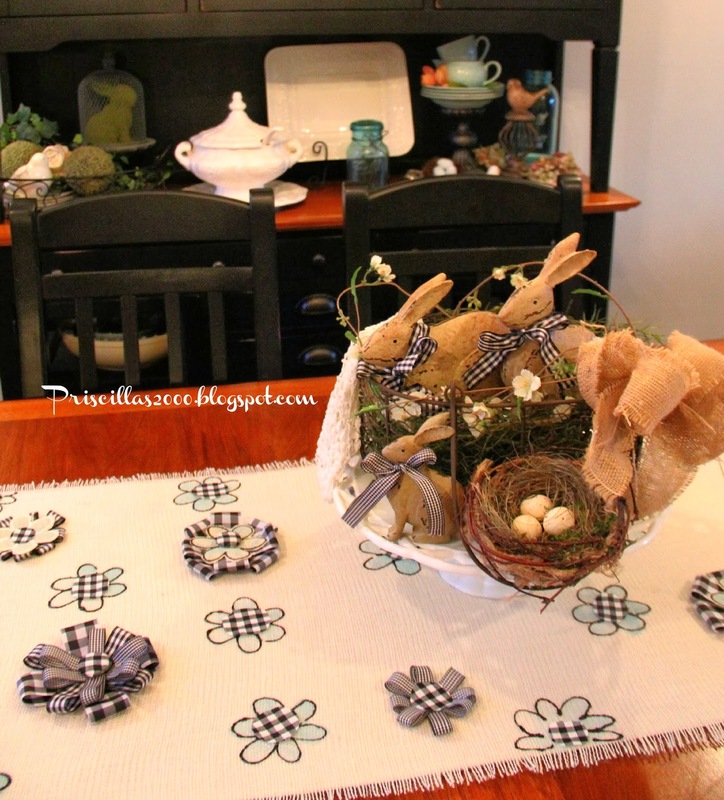 The dining room is all set for spring now ! 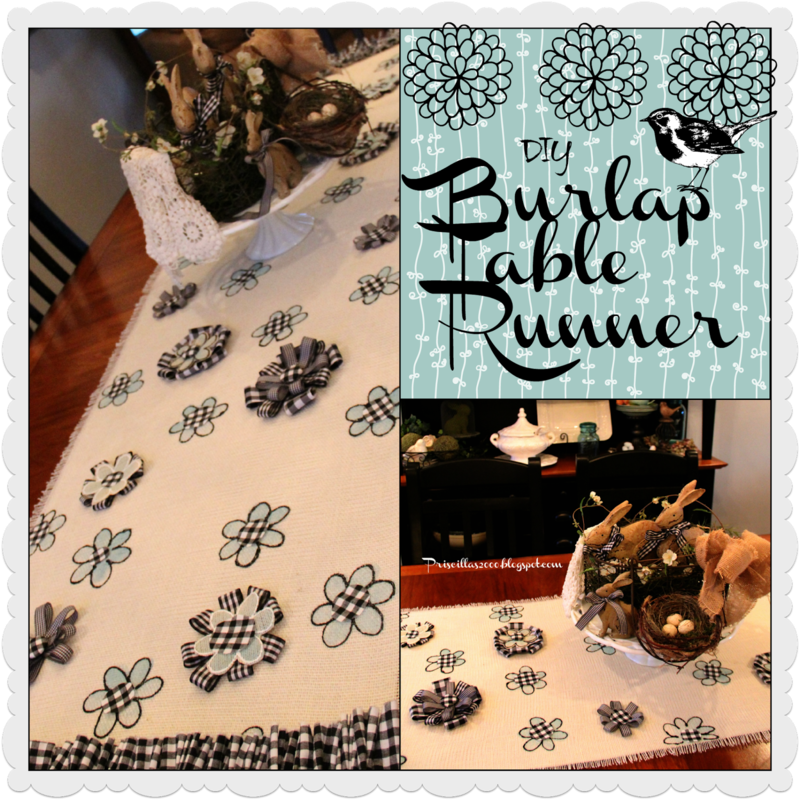 I hope you get crafty and make a table runner use that coupon :)!! 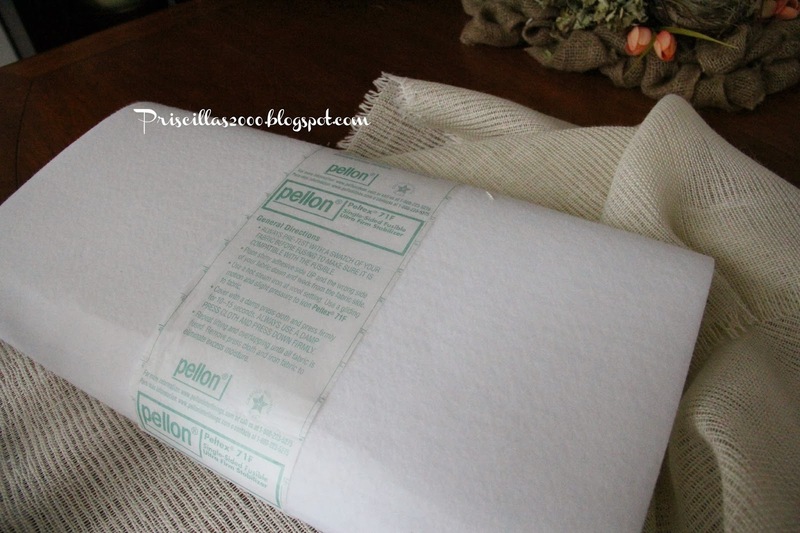 I love, love,love this white burlap from Jo-Ann Fabrics ! Thanks so much for stopping by ! I love your visits and your comments make my day ! It's so pretty. I can imagine it in many colors! oh my goodness is this adorable or what! Love it. Priscilla, the b&w is such a fun twist for Spring. It's easy to see why JoAnne's has you creating for them. The checkered fabric is so cute with the white burlap! So glad that you will be sharing it with SYC. Its brilliant!! You make it look so easy, which I guess it is but never having done anything like that before I think I would need someone by my side guiding me, fancy a trip to the UK to give me a hand lol!!!!!! You really do have such great ideas. Thank you so much for sharing. 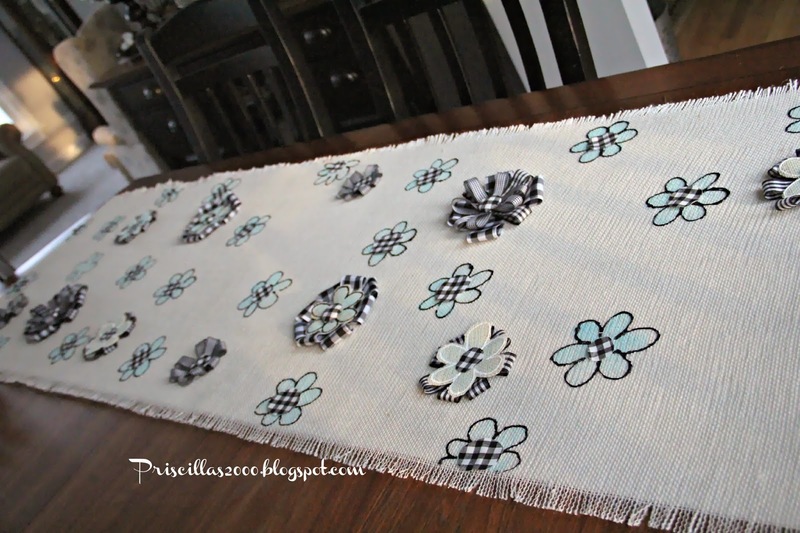 What a fun and creative table runner, Priscilla... I really like all the black and white! 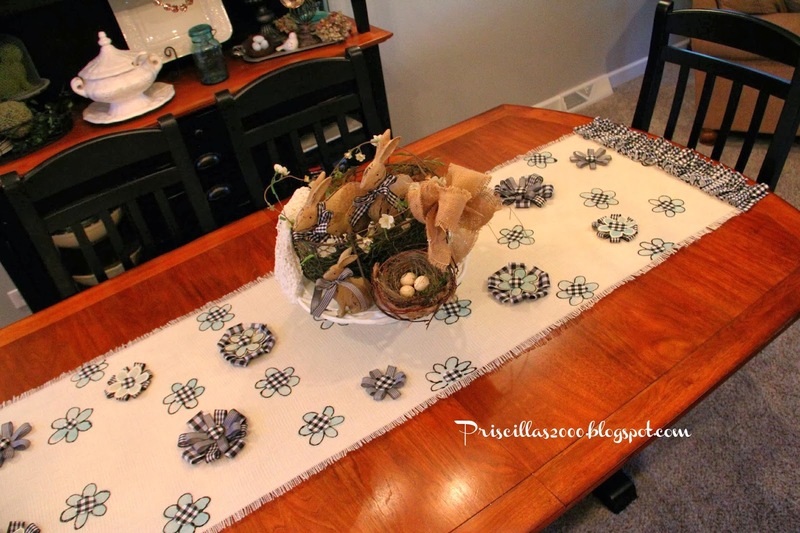 Love your table runner, it's so cheerful. What a fun idea! I love the flowers sticking out and the burlap makes it so you can have any color. Great idea!! Thanks for linking up to Tips and Tricks. 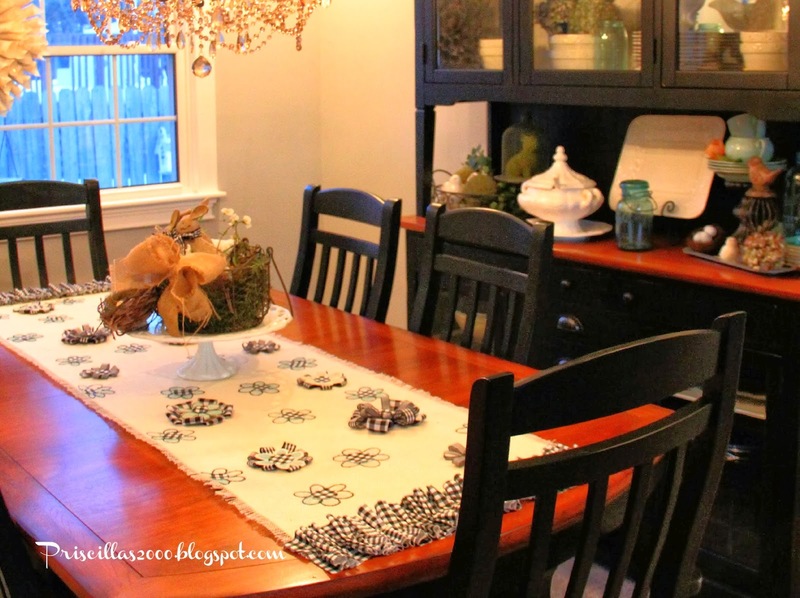 This is an adorable use of burlap! This is so adorable and clever, Priscilla! Your project will be featured at this week's The Scoop linky party that goes live on Monday night. Thank you for linking up! Thats pretty nice, I like the black and white. Looks easy, or at least you make it seem easy. So cute!!! Love how you stamped on flowers and made 3d flowers! Adorable. Coming over from At the Picket Fence. Cheers! Your runner turned out so cute!